Well over a million dogs served on both sides during World War I, carrying messages along the complex network of trenches and providing some measure of psychological comfort to the soldiers. The most famous dog to emerge from the war was Rin Tin Tin, an abandoned puppy of German war dogs found in France in 1918 and taken to the United States, where he made his film debut in the 1922 silent film The Man from Hell’s River. As the first bona fide animal movie star, Rin Tin Tin made the little-known German Shepherd breed famous across the country. In the United States, the practice of training dogs for military purposes was largely abandoned after World War I. When the country entered World War II in December 1941, the American Kennel Association and a group called Dogs for Defense began a movement to mobilize dog owners to donate healthy and capable animals to the Quartermaster Corps of the U.S. Army. Training began in March 1942, and that fall the QMC was given the task of training dogs for the U.S. Navy, Marines and Coast Guard as well. The K-9 Corps initially accepted over 30 breeds of dogs, but the list was soon narrowed to seven: German Shepherds, Belgian sheep dogs, Doberman Pinschers, collies, Siberian Huskies, Malumutes and Eskimo dogs. Members of the K-9 Corps were trained for a total of 8 to 12 weeks. After basic obedience training, they were sent through one of four specialized programs to prepare them for work as sentry dogs, scout or patrol dogs, messenger dogs or mine-detection dogs. 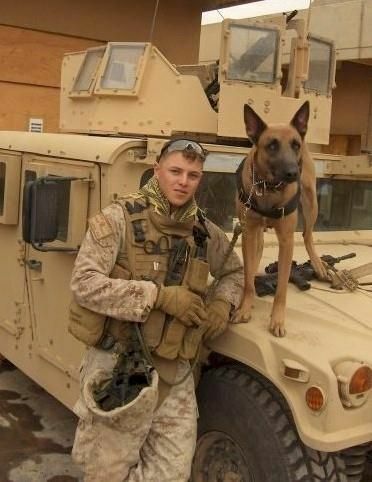 In active combat duty, scout dogs proved especially essential by alerting patrols to the approach of the enemy and preventing surprise attacks. The top canine hero of World War II was Chips, a German Shepherd who served with the Army’s 3rd Infantry Division. Trained as a sentry dog, Chips broke away from his handlers and attacked an enemy machine gun nest in Italy, forcing the entire crew to surrender. The wounded Chips was awarded the Distinguished Service Cross, Silver Star and the Purple Heart–all of which were later revoked due to an Army policy preventing official commendation of animals.